There’s double cause for music lovers to rejoice this June as the 18th Summer Krakow Opera Festival finds full voice, and marks the start of four months of events celebrating the 60th anniversary of the Krakow Opera. 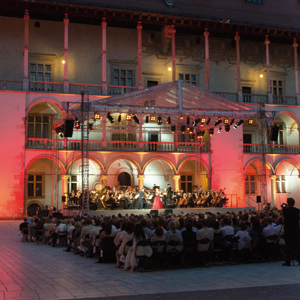 Every year, the Summer Opera Festival attracts thousands of music lovers from across Poland, and the globe, to experience top-flight performers in sumptuous, and sometimes unexpected, locations. Most of the 14 events on the calendar this year will be held at Krakow’s stylishly modern opera house, but audiences will also be invited to the high Renaissance splendour of Wawel Castle’s Arcade Courtyard, and a former gas works in the heart of the city’s ancient Jewish district. “Traditionally, some of the festival’s events are held outside the Opera House. This year, for the first time, we will be inviting festival-goers to visit the Jewish district of Kazimierz,” said the festival’s head of hospitality and marketing, Anna Kościelna. “I’m really looking forward to the open air Fiddler on the Roof premiere there – it should be spectacular, and I’m sure lots of people will go home humming ‘If I Were a Rich Man,’” . The range of music matches the diversity of the settings, including firm favourites such as The Marriage of Figaro (with New York Metropolitan Opera baritone, Mariusz Kwiecień), but also the first ever performance of Prokofiev’s The Love for Three Oranges in Poland, and traditional Japanese kabuki theatre. Underlining the long association between the Krakow Opera and ballet, the festival includes a ballet gala starring international and Polish star dancers – one of the spectacular highlights to be held at Wawel Castle. “The Grand Pas ballet gala in the castle will feature performers from the Mariinsky Theatre of St. Petersburg, Teatro di San Carlo in Naples, the Royal Swedish Opera, the Polish National Ballet and the S. Moniuszko Grand Theatre, as well as our own Krakow Opera team of course,” added Anna.